Joe Montana and the San Fransisco 49ers had been one of the top teams in the NFC since they beat the Miami Dolphins 4 years prior in the Super Bowl however they had not been back to the big game since. Boomer Esiason and the Cincinnati Bengals were a talented team who were becoming the class of the AFC. Esiason was the league MVP however the NFC was known to have been the dominant conference back in that time and Montana and the Niners were heavy favorites in the game. The game started off auspiciously for both teams. 49ers starting offensive tackle Steve Wallace broke his ankle on the first drive of the game and had to be carted off of the field. A few plays later Bengals defensive tackle Tim Krumrie broke a bone in his leg in two places and had to be carted off himself. When things calmed down the Niners were driving down the field for a score. They had a few drops deep in Cincinnati territory and had to settle for a 41 yard field goal from kicker Mike Cofer. The Niners held the Bengals and on their next drive. 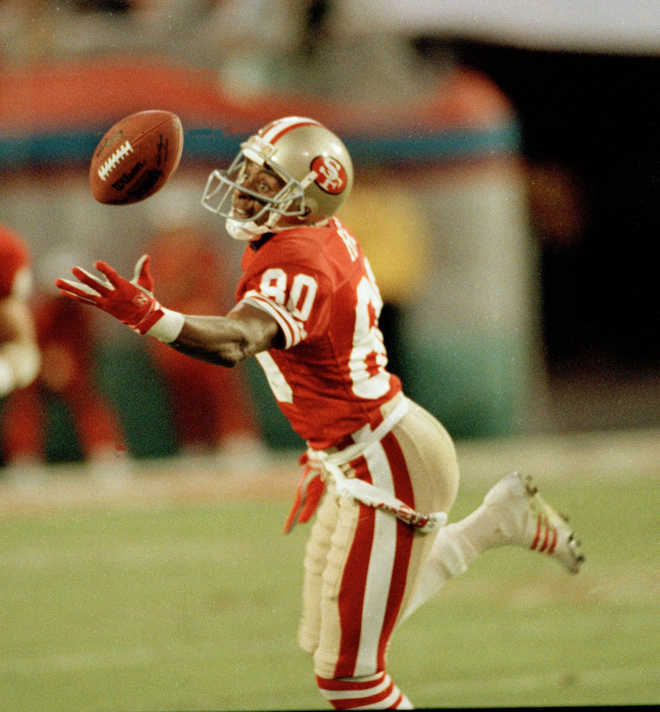 On the 49ers next drive Jerry Rice made one of the more famous catches in Super Bowl history when he caught a ball with one hand after he tipped it to himself with his other hand. They moved the ball inside the Bengals’ 10 but safety David Fulcher stonewalled fullback Tom Rathman on 3rd and goal from the 2. Niners’ center Randy Cross botched the snap on the field goal attempt and Cofer could not convert on the 19 yard attempt, the shortest field goal miss in Super Bowl history. The two teams went back and forth for the rest of the half without either team being in position to score. Finally towards the end of the first half Bengals cornerback Ray Horton took a short San Fransisco punt and returned it into 49ers’ territory to the 44 yard line. They could only manage 28 yards on the drive but it was enough to set up kicker Jim Breech for a game tying 34 yard field goal with 1:15 left to go in the half. That was all the scoring in the first half, the teams were tied at 3-3 going into the break. The Bengals took the ball to begin the 2nd half and held it for more than half of the 3rd quarter. Esiason got the Bengals going on their first sustained offensive drive of the game but after 12 plays, 61 yards, and 9:15 of clock time all that they could muster was a 43 yard field goal from Breech to give the Bengals their first lead of the game at 6-3. The Bengals D forced a punt on the Niners’ first possession of the 2nd half but Esiason threw an interception to linebacker Bill Romanowski on the very first play of the next drive and set the Niners up with a 1st and 10 at the Bengals’ 23 yard line. The Niners could not generate a 1st down and they settled for a 32 yard field goal by Cofer to tie it at 6-6. There was less than a minute left in the 3rd quarter and there was still no touchdowns in the game. No Super Bowl had ever gone without a touchdown through the first 3 quarters. Bengals running back Stanford Jennings made sure that this Super Bowl wouldn’t be the first. He took the kickoff after the Cofer field goal and ran it back 93 yards for a touchdown. It was the first TD of the game and it gave the Bengals their first lead of the game at 13-6 with a little more than a quarter to play. Montana was not rattled despite being held out of the end zone for three full quarters. He hit a 31 yard pass to Rice to open up the next drive. 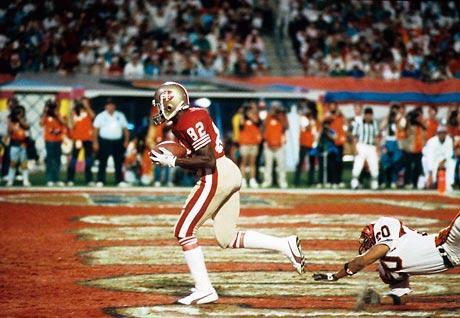 The next play was a 40 yard pass completion to running back Roger Craig. After cornerback Lewis Billups dropped a sure interception in the end zone Montana connected with Rice from 14 yards out to tie the game at 13-13. The Bengals went three-and-out on their next possession. Montana went deep to Rice yet again, this time going 44 yards on a connection, but the Niners drive stalled and Cofer missed another field goal, this one from 49 yards out. Esiason and the Bengals went right down the field on the next drive, going 10 plays and 46 yards but once again settled for a Breech field goal, this one from 40 yards out, to give the Bengals a 16-13 lead with 3:20 left to go in the game. After a penalty on the kickoff the Niners had to start the next drive from their own 8 yard line. Montana led the 49ers on a 11 play, 92 yard drive. Montana and Rice keyed the drive, including a 27 yard connection on 2nd and 20 from the Bengals 45 yard line. Montana capped off the drive by finding receiver John Taylor sliding into the back of the end zone with a 10 yard TD pass with just :39 remaining to give the 49ers a 20-16 lead. The Bengals couldn’t pull off a miracle and Montana had his 3rd Super Bowl Championship. 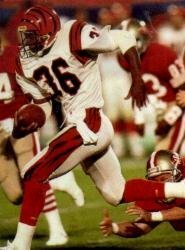 Montana solidified his “Joe Cool” reputation with his performance in the 4th quarter of Super Bowl XXIII. The Niners were well on their way to the “Team of the Decade” moniker and would solidify it with a blowout win over the Broncos in the next Super Bowl. The Bengals have not even made it back to a championship game since the 1988 season. 30 year old sports enthusiast and aspiring writer from Boston.